Achieving record low power usage effectiveness (PUE) on Japan’s first artificial intelligence (AI) supercomputer. The Tokyo Institute of Technology (Tokyo Tech) initiated the TSUBAME 3.0 supercomputer project to create the first and fastest artificial intelligence (AI) supercomputer in Japan. To do this, it had to achieve unrivaled Petascale speeds. The TSUBAME 3.0 is a multi-purpose project. The university developed it for education purposes, for high-technology research and to serve as an information hub for this leading Japanese university. The university also plans to open it up to outside researchers in the private sector. This supercomputer is designed to deliver more than 47 PFLOPS of AI horsepower. When operated concurrently with the TSUBAME 2.5, it is expected to deliver 64.3 PFLOPS. This makes it Japan’s highest performing AI computer. Technology was needed that could fulfill the high workload requirements, while achieving ambitious energy-efficiency objectives and working within significant space constraints. The solution chosen was the water-cooled SGI ICE XA (HPE 8600). ServerCool partnered with Hewlett Packard Enterprises (HPE) to deliver the best, most effective liquid cooling solution for this high-performance computer. ServerCool’s CD6C was selected to provide the SGI ICA XA, and its related ancillaries, with the liquid cooling capabilities it required. The CD6C features quiet operation, high facility water temperature, low power usage, and full redundancy and monitoring. In total, four CD6C units operate from a facility water loop within W3-W4 to protect and feed the cold plates and rack cooler – fulfilling 100% load dissipation. The average load per rack is estimated to be in the region of 50 kW – the aim being to deliver a completely “compressorless” cooling solution. “The performance of this project proves that ServerCool systems are an effective liquid cooling solution to provide efficient cooling performance to ultra-high-density computers and keep TCO to a minimum,” says Jimmy Daley, Vice President Apollo Engineering and HPC/AI Program Office. The ongoing agreement between HPE and ServerCool enables worldwide coverage. Through this comprehensive network of global service partners, ServerCool is able to deliver complete, reliable solutions while adhering to stringent uptime requirements. The TSUBAME 3.0 supercomputer project has far exceeded expectations. 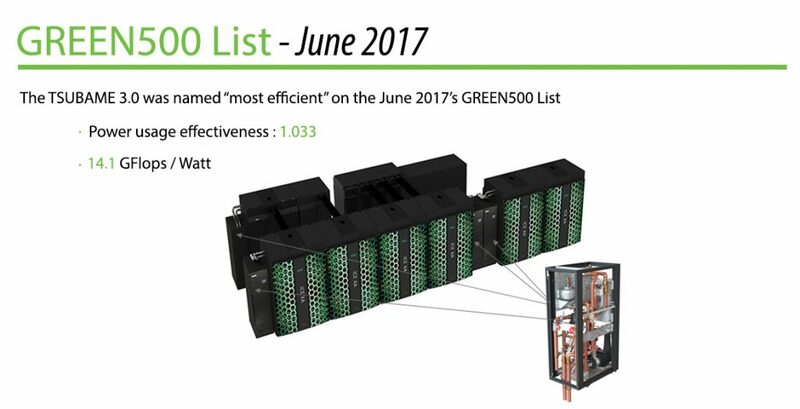 In fact, it claimed the top spot on the June 2017 Green 500 list, achieving a PUE of 1.033 and performance at 14.1 GFlop/Watt.